Modern art is overrated; ancient art is the way to go. We'd slogged almost three hours through the searing desert heat to reach it, but Toro Muerto is worth the effort. 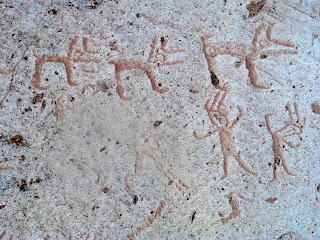 Thousands of petroglyphs etched into hundreds of boulders strewn across the desert high above the Rio Majes valley. Once you actually find them they're cool. The sun, meanwhile, is not. Up and up we traipsed after leaving the village of Corire, first along a mosquito-infested dust track beside paddy-fields irrigated by the precious river, then along a dirt-track irrigated by nothing, then over sand dunes and rocks, climbing higher all the while, sun beating down without pity regardless. For the first time in my life I can honestly say the sun was splitting the stones; rocks bore testament to its fury wherever we looked, halves still side by side where they parted, not fully able to face life apart. The horizon shimmered and shimmied up ahead, the waves of heat causing it to dance before our eyes. Not a sign of life to be seen anywhere, no plants, no birds, not even an oul' cactus - not a soul. And still we slogged on, sweat pouring from every pore and poring from every pour. Even the hairs on my chinny chin chin were sweating, but the Big Bad Wolf had sensibly stayed at home to sip an ice-cold mojito. These are the things which run through your head as you're climbing up a rocky sand dune with neither end nor petroglyphs in sight. Where the hell were they?! We'd been slogging along for hours! The tongues hung out of our heads, much like the dogs' in the village. Now I know why they had been looking at us strangely as they watched us pass with their big eyes. "You'd be mad to go up there!" And they were barking. 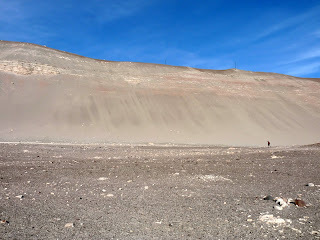 We'd just climbed the highest dune, looked around and saw nothing but rocks and sand below us - not a petroglyph to be seen anywhere - when we decided to start heading back. Feck it. It's just another scam. They don't exist at all. We headed back down and that's when we found them. 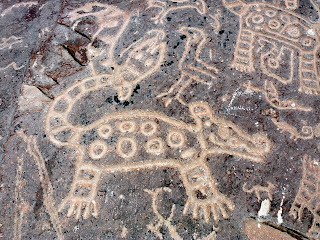 Little dancing figures with rectangular heads etched into the rock, birds too, llamas or llama-like creatures, wolves with long noses, jaguars, snakes, dragons, cats, dogs, suns, squiggly lines, straight lines, dots and designs, hundreds of them! 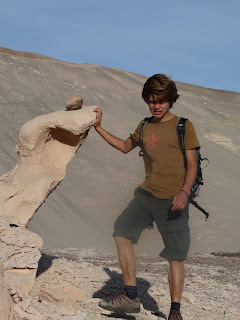 On every rock! We ran from boulder to boulder like excited puppies. "Wow, look at this one!" "Come here, check this one out!" "You come here, check this out!" The figures were wonderful; friendly faces and kindly shapes, etched for reasons known only to the etchers who were most probably the Wari people about 1,200 years ago. These are the same people who conquered the Nazca people around around 700 or 800AD before adding their own contributions to the lines. 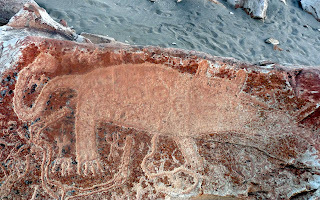 There's a striking resemblance between the giant "astronaut" etched into the hillside at Nazca, and one of the petroglyphs we found at Toro Muerto. Coincidence? I think not. Perhaps Toro Muerto was a sketch pad for grander schemes. 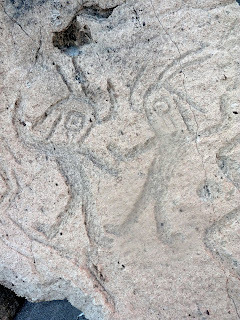 Spread over 5km of high desert, some 2,500 figures are to be found, although this figure figure varies wildly with figures of 5,000 figures and even 10,000 figures being figured upon. I didn't count them. There's a lot. Go figure. Scientists and archaeologists, of course, are baffled by the whole thing. What they get paid for at all is beyond me. Again, I reckon the Wari just did it for the laugh. There ya go, another ancient mystery solved. Some senseless idiots have been leaving their own etchings at the site too, writing their names on the rocks to show how much they've regressed since the time of their ancestors. Unfortunately, it seems the Wari, Nazca et al had more initiative than their descendants who should be doing a lot more to protect their unique heritage before it's too late.